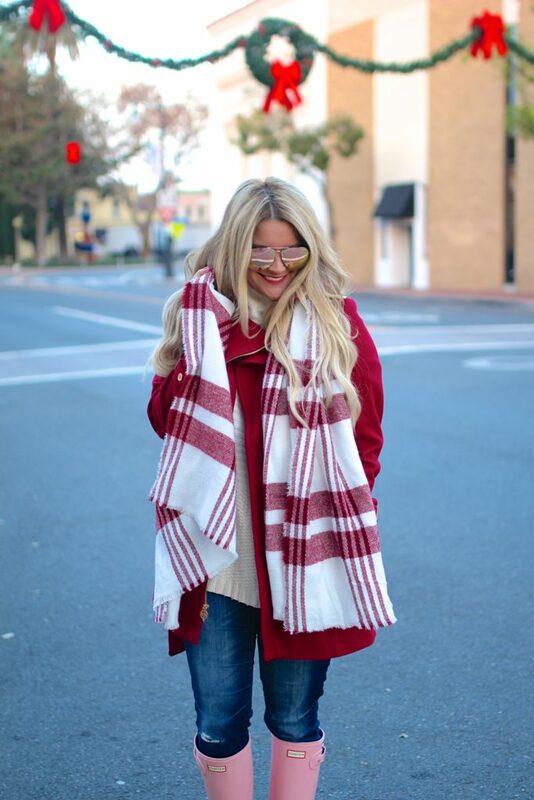 This scarf is a perfect match for your jacket! And I love it paired with the pink Hunters! Yay for NYC at Christmas! It seriously is magical. I’m so excited you guys have a trip planned to the east coast. DC isn’t too far 😉 Have so much fun at your party this weekend! And Santa did an awesome job with that tree. It is quite possibly the most amazing tree I’ve ever seen! Have a great weekend, Shauna! Week, so much to talk about in this post! NYC..yes, we were there once in November and got to see the ball inside Macys that they drop in times square. A few areas were decked out in lights and it was magical..ahhh December will be stunning. And speaking of stunning..look a this festive ensemble..love the color combo!! You loo so ready for the Holidays. may your party be a huge success with lots of fun and laughter!! You know I LOVE that tree and YOU!!! Have fun sweet friend! You sure seem excited for Christmas! I LOVE those decorations behind you. I actually think warm states do more with outdoor decorations because they don’t have to freeze to death outside while decorating…and people are outdoors more to enjoy it. I LOVE your red coat and scarf! Too cute! You look so cute and cozy in this pretty red coat. HAve so much fun at your party this weekend! There really is something about Christmas in the city! The lights, music and people rushing about really puts me in a holiday spirit. 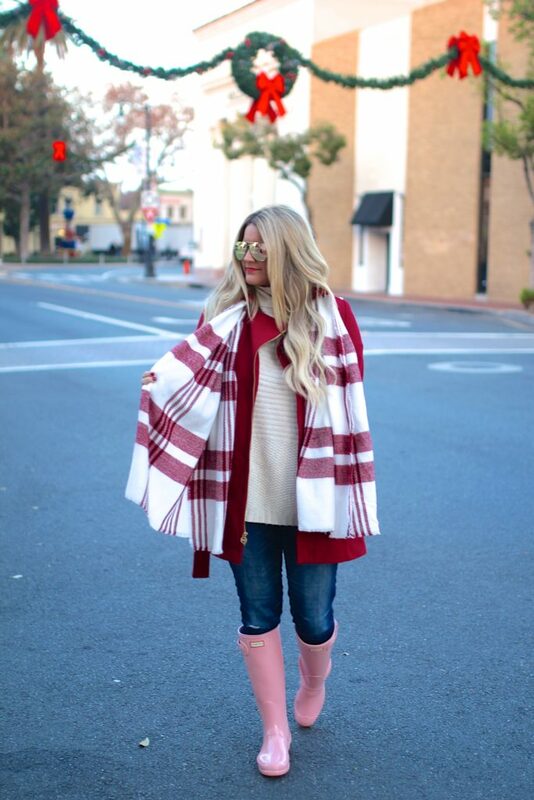 This coat and blanket scarf combo is gorgeous! Such a beautiful look Shauna! You look like the cutest festive candy cane! I love the pink boots with this! Such a pretty look! The boots are so cute and your hair looks great! Omg! This is the cutest Christmas look ever! LOVE the plaid scarf, it’s so festive! Really love your pink boots too! I have always wanted a pair now I know what color to get, haha! Oh wow! This look is simply amazing! What a nice pink boots 🙂 Nice! Have a great weekend! 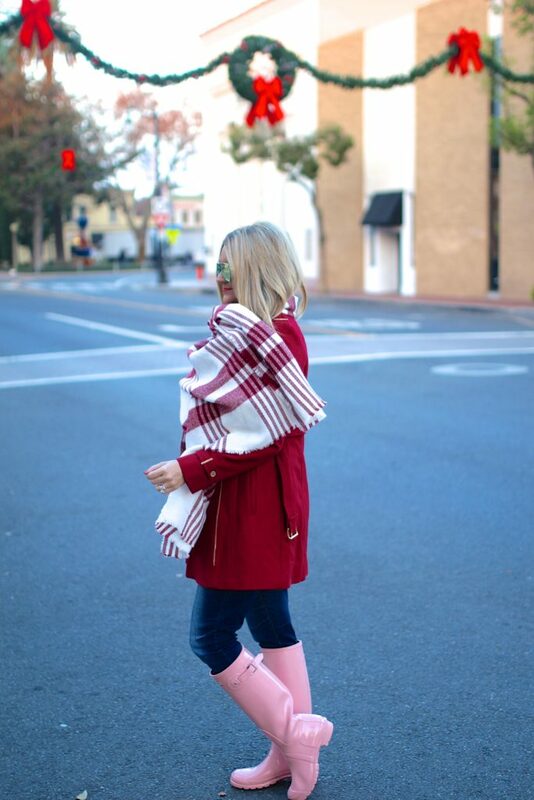 Pretty scarf and coat, but those booties are suuuuper cute! Ahh this is SO cute! I really love the red paired with pink! Such a girly touch! Your scarf is amazing btw! This is the cutest, casual holiday look! 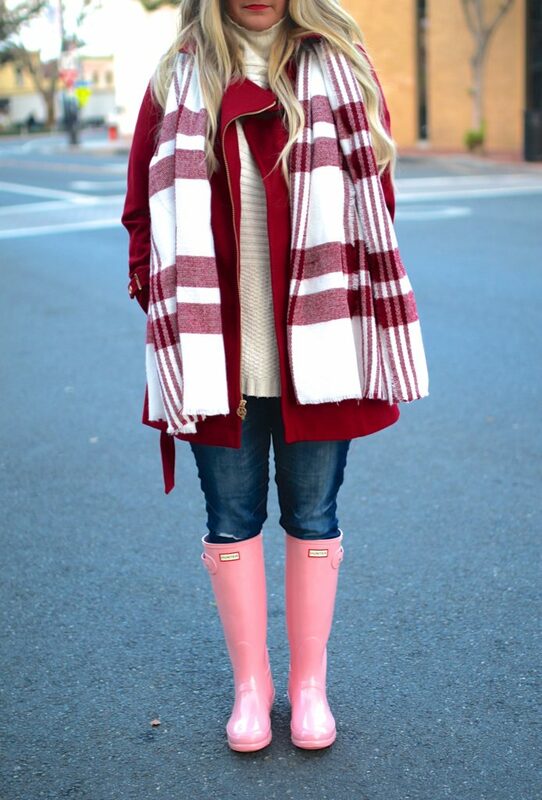 I love the red coat, and Hunter boots. I’ve never been to NYC during the holidays either, and it’s on my bucket list! That scarf is so beautiful. You look great. Nice jacket too. I have never seen pink Hunters before, but I love them! I have a red pair. That scarf is so festive, especially with that red coat. I would love to visit NYC during the holidays! My hubby and I were in New York after Christmas and stayed through the new year when we got engaged (he proposed at midnight!) It is gorgeous with the hustle and bustle and all the lights! Definitely something to be excited about next year 🙂 I love this look and those pink hunter boots are adorable! Such a great look, and your hair looks fabulous! Darling! 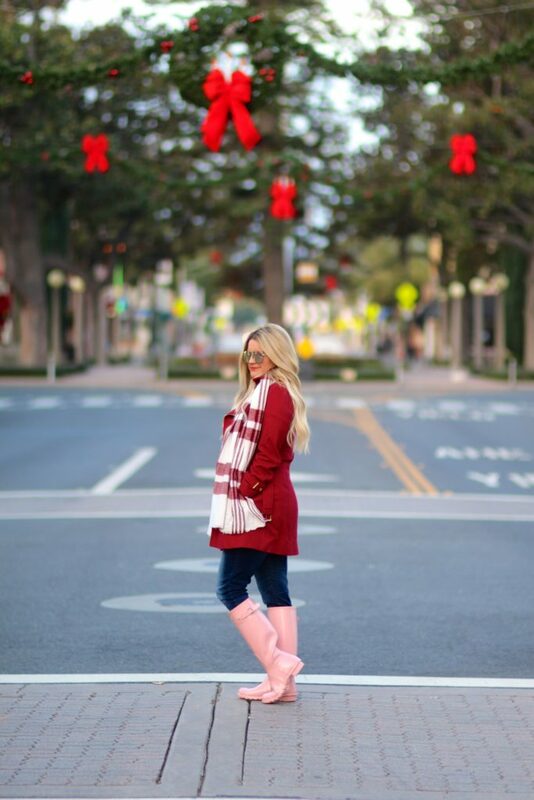 love the pop of pink with your fun boots! Love the backdrop for these photos! So Christmasy! And your jacket and scarf combo is so cute!